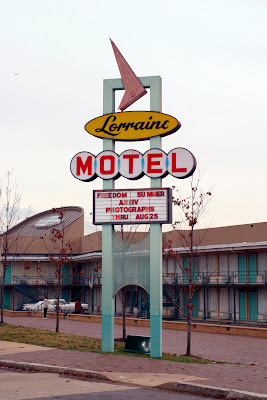 If you have the chance to stop by the Lorraine Motel in Memphis, TN., I recommend it. The spot where Martin Luther King, Jr. was assassinated is haunting and sad and is frozen in time. The Civil Rights Museum is housed here and it is, of course, an important document of a pivotal time in American history. My quibble with the place is that the the location itself defines the museum in a way that another location may not have. There is a nearly fetishistic fixation on the murder of King. His hotel room is preserved, an entire room is devoted to artifacts related to the murder (including the gun and bullet pulled from the body), and in what I would consider the most disturbing element of the tour, you can stand in the spot the killer stood in when firing the fatal shots. It’s fascinating but also sad and morbid. I wonder if the museum might have been more uplifting and also inspiring if it hadn’t started and ended with death? Not to say that the civil rights movement wasn’t filled with stories of those that lost their lives for the struggle but this museum fixates heavily on King’s murder and I just found it sad and ending on a really low point in history.